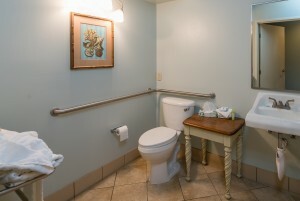 Morro Shores Inn is an exclusive property where every guest reservation is both important and special to us. If your travel plans change and you must cancel your reservation, please contact us at least 3 days prior to your arrival date to cancel your reservation. 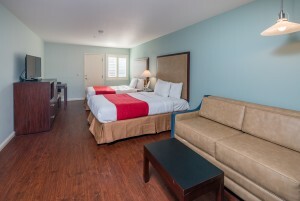 If you made a reservation within 3 days of arrival, your reservation is considered non refundable. In the unlikely event that you must cancel with less than three (3) days* notice, shorten your stay or check out early, please understand that we must ask you to take responsibility for your entire reservation. 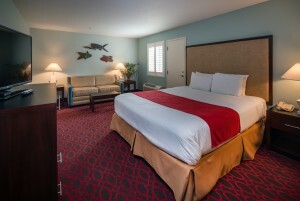 If we can rebook your room(s), a full or partial refund will be made. 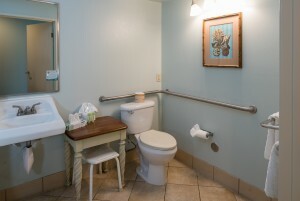 Rates/policies are subject to change and vary during high impact periods and special requests. 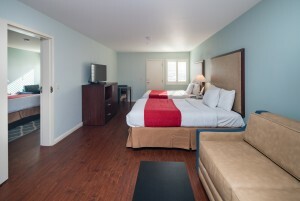 You are receiving our best rates and value by booking online with us. Web rates cannot be combined with any other offers (discounts) or specials. Invalid or declined credit cards will lead to a false reservation and will be canceled, unless guest has contacted the Inn for arrangements. 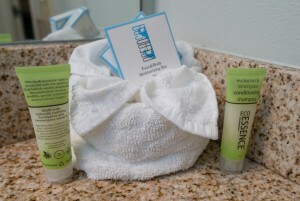 Note: There is a $5 per room nightly service fee which is included at check-in. 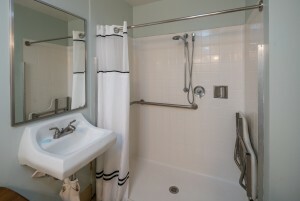 *A 30-day cancellation notice is required on whole house bookings and for some holidays and special events. AAA Members receive a 5% discount per night. Must provide your AAA Membership card during check in. 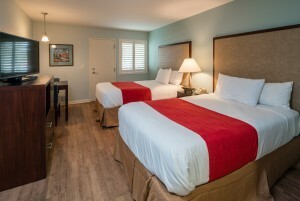 The Two Double Beds room is a perfect accommodation for a small family visiting Morro Bay. 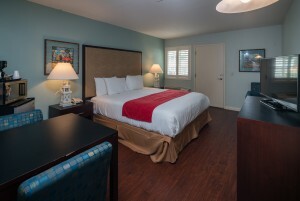 This partial park view room consists of two double beds with pillow top mattresses able to accommodate up to 4 adults. We also offer a 40-inch LED HDTV, refrigerator, coffee maker, microwave, and iron, ironing board. This room features a private bathroom with granite vanity and full bath, hairdryer, and signature toiletries. Free High-Speed Internet is available. 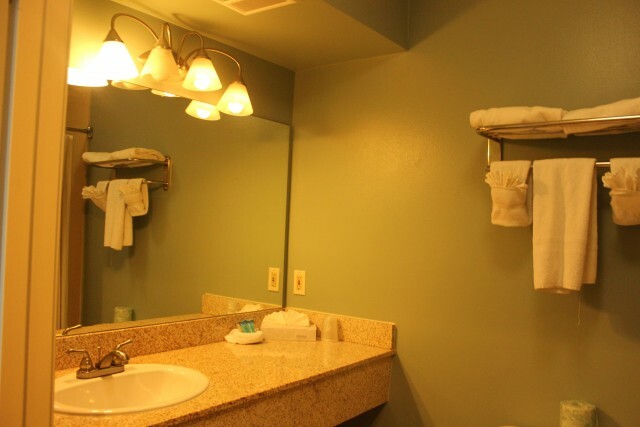 This property is privately owned and The Management reserves the right to refuse service to their discretion. The Management will not be responsible for accidents or injury to guests or for loss of money, jewelry or valuables of any kind. Once checked in, no cancellations will be honored. 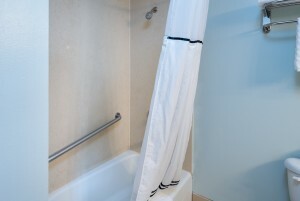 All linens are inventoried: missing or damaged linens will be charged. 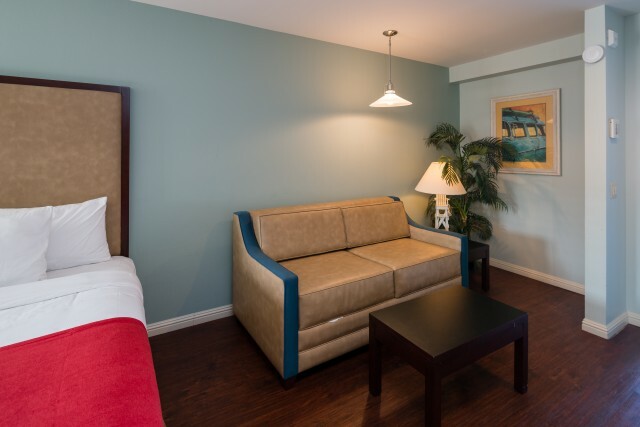 Any damages to hotel property will be charged an additional fee upon assessment. This is a NON-SMOKING facility. 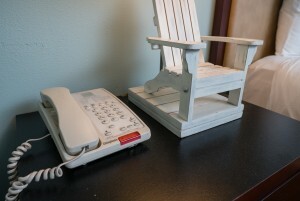 Guest acknowledges that smoking is not allowed in guest rooms. Designated outdoor smoking areas are available. 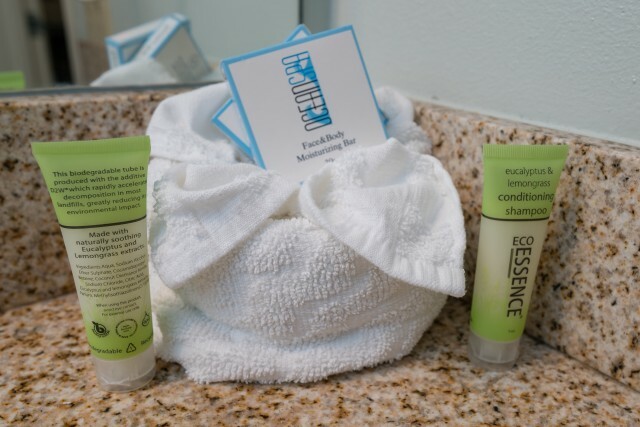 If anyone in guest's party smokes in the guestroom, guest hereby expressly authorizes hotel management to charge credit card the amount of USD 250.00 to reimburse the property for the additional cost of cleaning guest room. 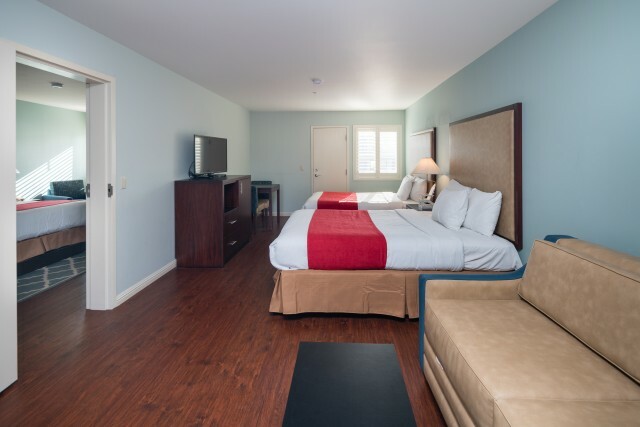 If your reservation has been paid in advance or you elect to pay by cash, a USD 150 security deposit via credit card will be required upon check-in and will be charged in the event that damages outlined herein occur. 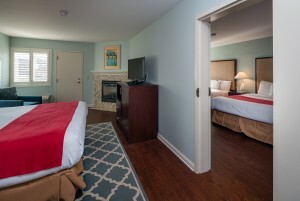 The Two Queen Bedroom is our standard family room that can accommodate up to 4 adults with ease. 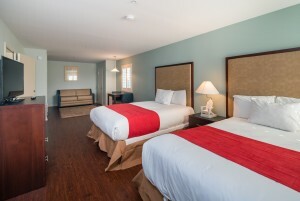 This partial park view room consists of two queen beds with pillow top mattresses. 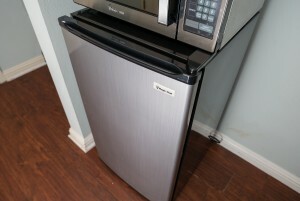 We also offer a 40-inch LED HDTV, refrigerator, coffee maker, microwave, an iron and ironing board. Free high-speed Internet is available. 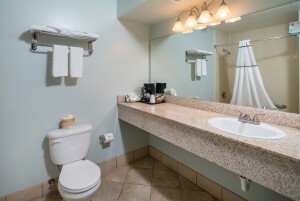 This room features a private bathroom with granite vanity and full bath, hair-dryer, and signature toiletries. 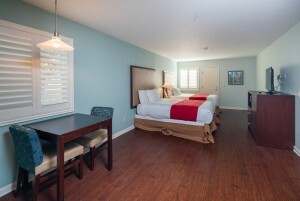 The King Luxury guest room at Morro Shores Inn is perfect for small families of up to 4 persons. 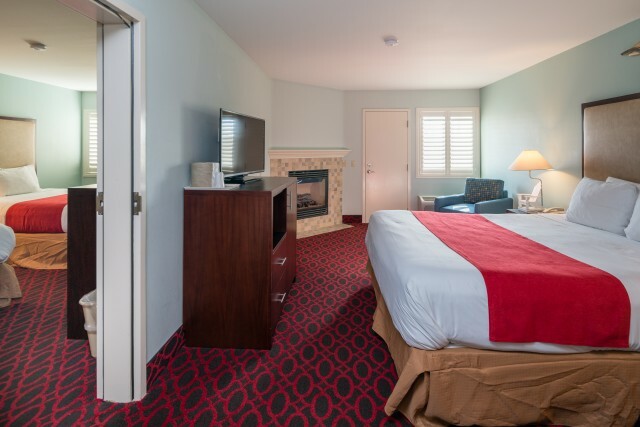 With views of either the courtyard or spa house, these rooms have 1 king bed with a pillow top mattress and 1 queen size sofa sleeper. 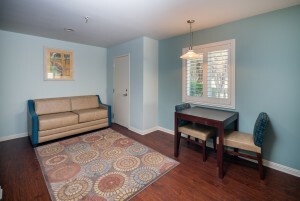 We also offer a 40-inch LED HDTV, refrigerator, coffee maker, microwave, and iron, ironing board. Free High-Speed Internet is available. 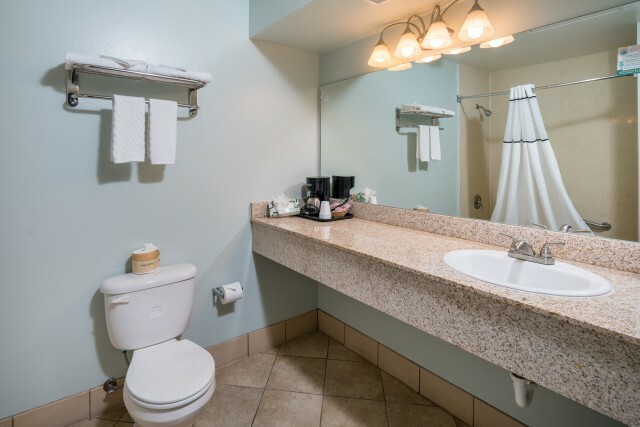 This room features a private bathroom with granite vanity and full bath, hairdryer, and signature toiletries. 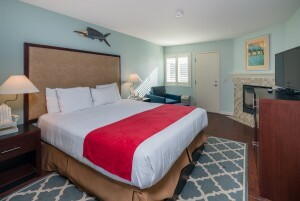 The air-conditioned Non-Smoking Morro Shores Inn Master Suite can comfortably accommodate 8 adults. 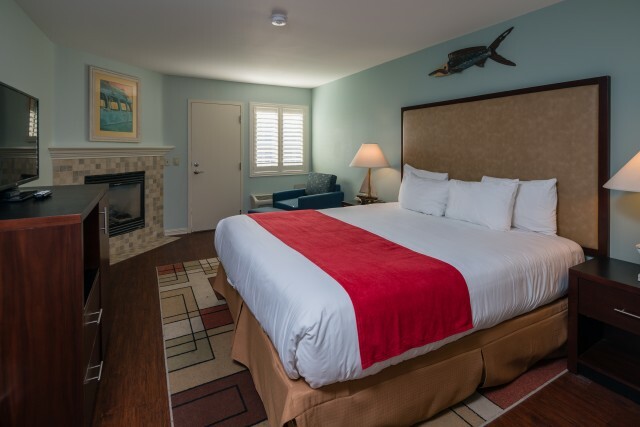 With a full park/Morro Rock view, this 2 double room junior suite includes 1 king size presidential pillow top bed, 1 sofa bed, and a chair with ottoman. This spacious suite offers a fireplace, 40-inch LED HDTV, refrigerator, coffee maker, microwave, iron, ironing board and hair-dryer. Free High-Speed Internet is available. The Family Suite offers a full bathroom with shower, hairdryer, and signature toiletries. 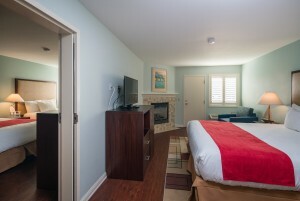 The Non-Smoking, air-conditioned Family Suite at Morro Shores is a perfect room for guests traveling in a large party. 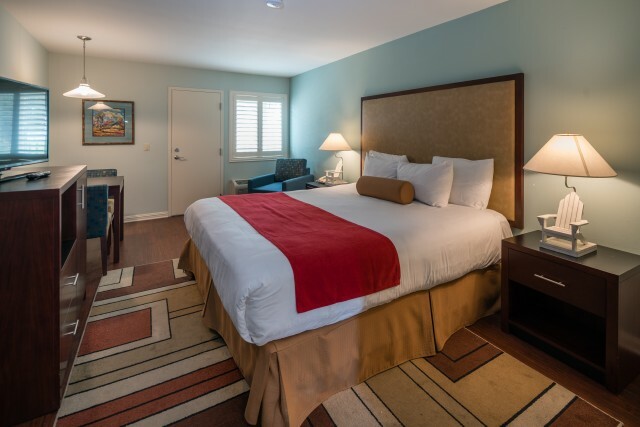 With partial park view, this 2 room executive suite includes 1 king size presidential pillow top bed, 2 double beds and a chair with ottoman. This two room suite can accommodate up to 6 adults in comfort. 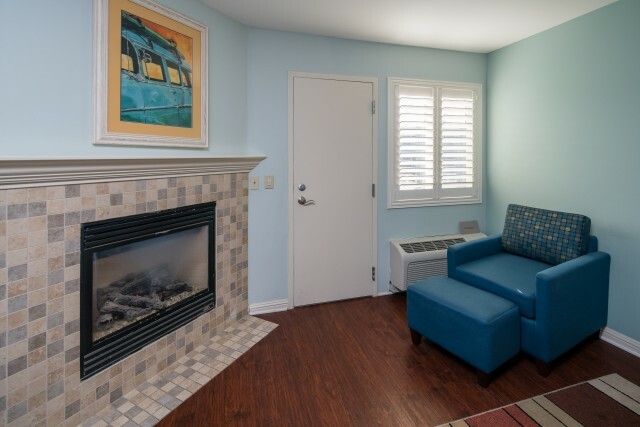 This Suite also offers a fireplace, 40-inch LED HDTV, refrigerator, coffee maker, microwave, iron, ironing board and hair-dryer. Free High-Speed Internet is available. 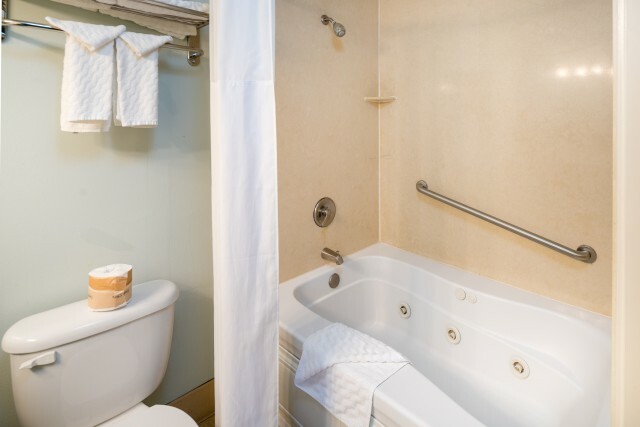 The Family Suite offers a full bathroom with shower, hairdryer, and signature toiletries. The King Standard guest room at Morro Shores Inn is a comfortable, well-appointed room that is perfect for couples. 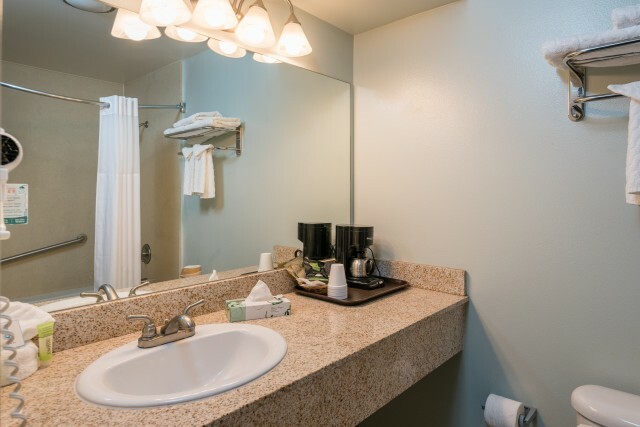 With views of the park, these rooms have 1 king bed with a pillow-top mattress, 40-inch LED HDTV, refrigerator, coffee maker, microwave, and iron, ironing board. Free High-Speed Internet is available. This room features a private bathroom with granite vanity and full bath, hair-dryer, and signature toiletries. 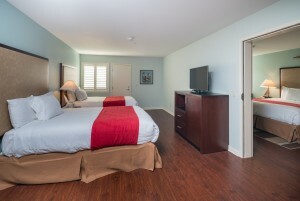 The King with ADA is our most affordable and accessible room that comfortably accommodates 2 adults. 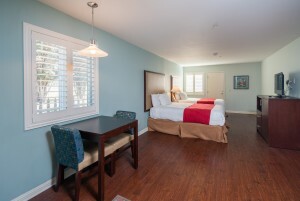 This partial park view room consists of 1 king bed with a pillow top mattress. 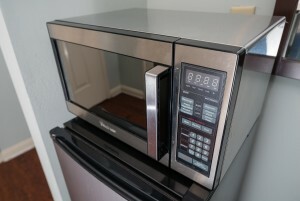 We also offer a 40-inch LED HDTV, refrigerator, coffee maker, microwave, iron, ironing board and hair-dryer. Free high-speed Internet is available. 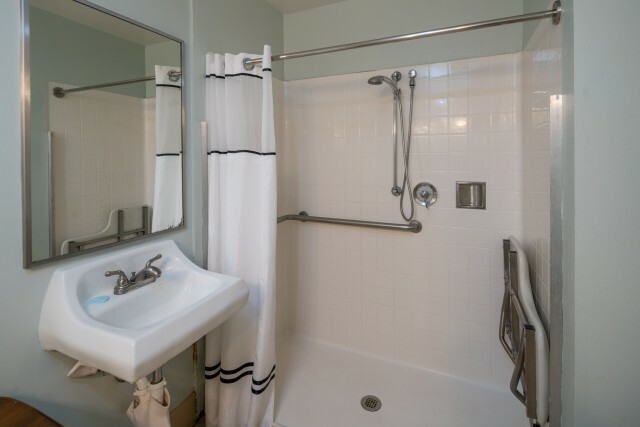 This room comes ADA Handicap accessible with a roll in shower and accessibility features. 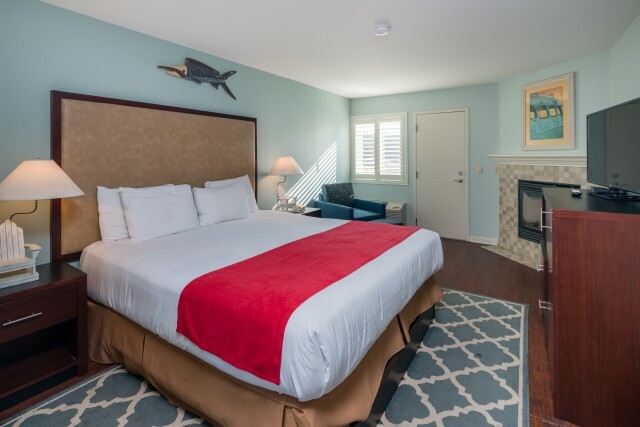 The Morro Shores Inn offers the air-conditioned Non-Smoking Luxury Suite that can accommodate up to 8 adults in pampered luxury. 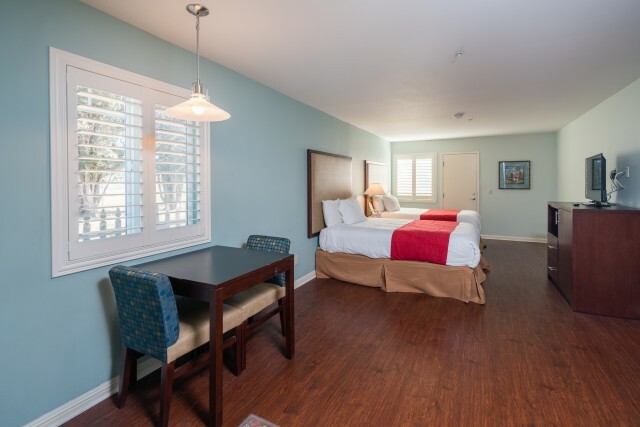 With a beautiful park view, this 2 double room luxurious suite includes 1 king size presidential pillow top bed, 1 sofa sleeper, and a chair with ottoman. The Luxury Suite offers a fireplace, 40-inch LED HDTV, refrigerator, coffee maker, microwave, and iron and ironing board. Free High-Speed Internet is available. The private bathroom has a whirlpool tub, granite vanity, hairdryer, and signature toiletries. Book Direct & Save! 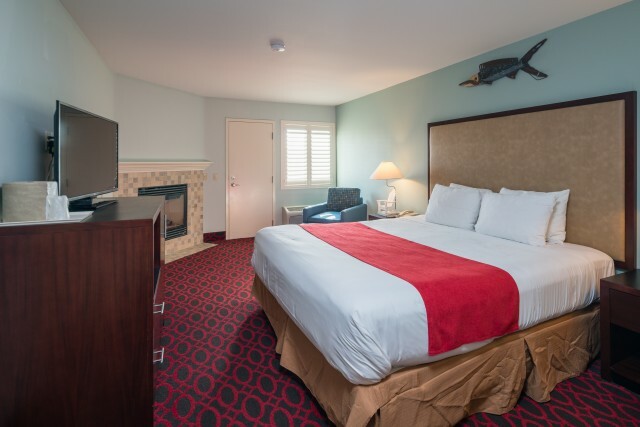 By booking directly on our website, you can save nearly 15% on your stay when compared to booking on third party booking sites.